I honestly can’t remember how long Verona was on my travel wish list but, I knew it would be love at first sight…and it was! 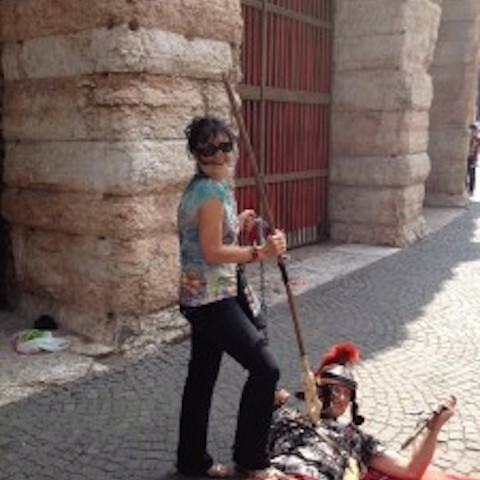 First, let me say that Verona is not to be missed! My best advice would be to avoid going in summer; it’s incredibly crowded and, definitely, try to stay a few days here. OK, that said…in spite of the fact that I was only able to stay for a day in summer, not only did I still love it, but it’s on my short list of places to return to and to stay for a longer visit. With over 250,000 residents, Verona is not only the second largest city in the Veneto after Venice, it’s the second most popular – hence, the crowds. 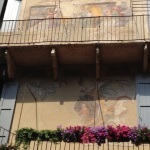 In addition, Verona’s designation as a UNESCO World Heritage Site affirms her beauty and historical importance. Of course, we can’t talk about Verona without talking about…oh, you thought I was going to start with Romeo and Juliet, didn’t you? Well, actually, there’s another prominent family besides the Montagues and Capulets. The well-known (and reputedly cruel) Scala family dominated Verona for over 127 years in 13th and 14th centuries. As a matter of fact, the Scaligieri family extended their rule and power far into the Veneto region. Castles and fortresses in the surrounding area and impressive family tombs in Verona, bear their unmistakable family crest displaying a ladder (scala in Italian) and attest to their reach and influence. 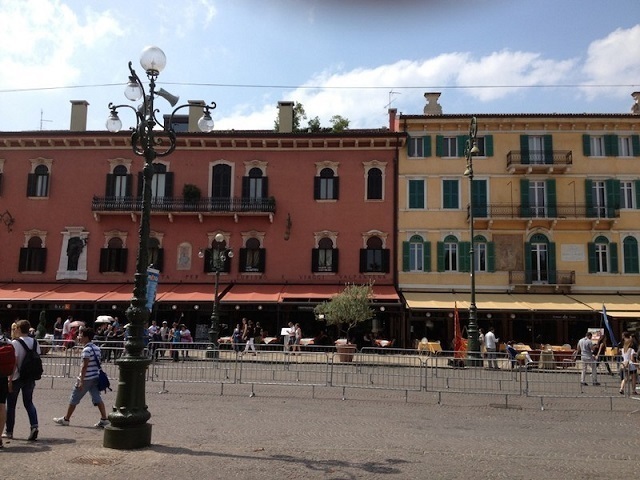 Verona has also been ruled by Milan, France, and Austria before uniting with the rest of Italy in 1866. 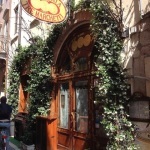 The Venetian lion, marking a long period of Venetian rule, is another highly visible and unmistakable symbol in this historic town. 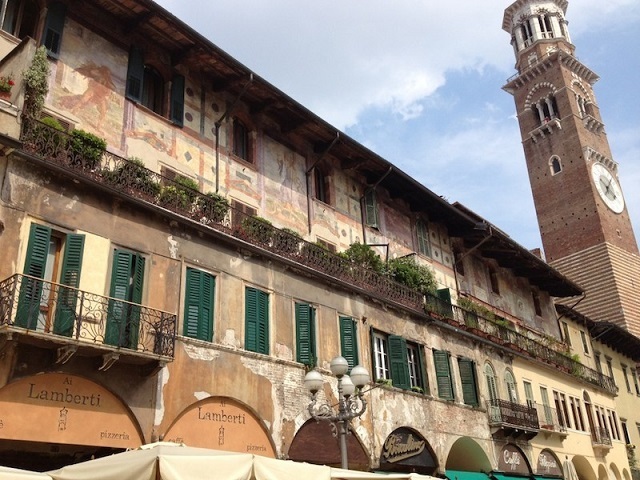 Today you can still admire the Colonna di Lion in Piazza delle Erbe in the heart of Verona. 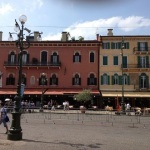 This stunning and historic piazza has a superb and abundant array of shops, stalls, sidewalk cafes and art galleries that will make your head spin! All I can say is bring your credit cards! Observing the lively scene, Dante seems to be taking it all in with a certain air of …well…you can’t help but wonder what he would think of all this? 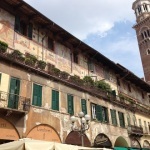 Conveniently, along with the Piazza delle Erbe, the heart of central Verona is primarily a pedestrian zone and that’s a very good thing because of the throngs of admiring visitors. It’s challenging enough to dodge bicyclists and other tourists distracted by the myriad shops, I can’t imagine what it would be like with vespas and cars. 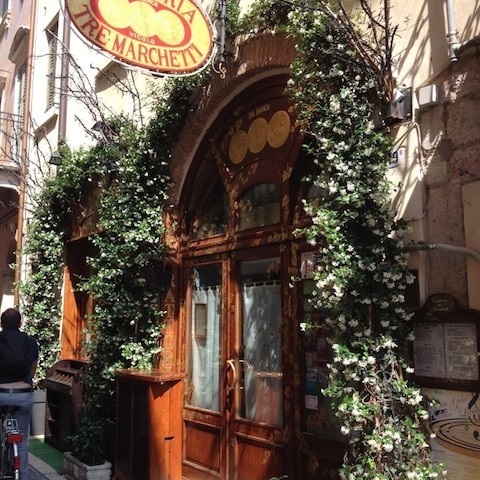 If shopping isn’t your favorite pastime, sitting at one of the many cafes lining the piazza, sipping an espresso or aperitivo and just people watching is highly recommended and quite entertaining! 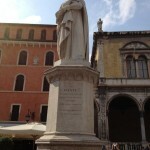 It’s impossible to think of Verona and not think “romance” and star crossed lovers or, at the least, two gentlemen, si? 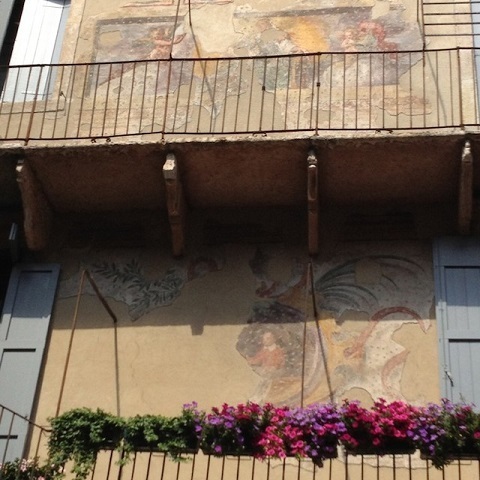 Of course, we must give Shakespeare his due and visit Casa di Giulietta, where Romeo gazed up into the eyes of his beloved Juliet (I guess no one cares where the two gentlemen of Verona lived?). Turned out not to be the inspirational, special visit I’d hoped for…not only is the narrow passageway into the tiny courtyard completely covered with graffiti (sad) and “locks” (oh, who started that fad? ), but the courtyard itself is jam-packed…crowded (and I mean crowded). Lines to go into Juliet’s house are long and sweaty so we forego that option (next time…). One can’t help but wonder what Will would say about all of the fuss? Well, first he would probably corroborate that there’s really no evidence that this really is Juliet’s balcony (it’s rumored to be the house where a family lived whose name was…oh, but really, who cares?). The attraction is undeniable. Juliet’s statue stands stoically in the little courtyard and poses while hopeful romantics snap photos and take turns touching her breast for good luck in love. Oh, the indignity of it all…but, of course, I do, too. After all, why take a chance? 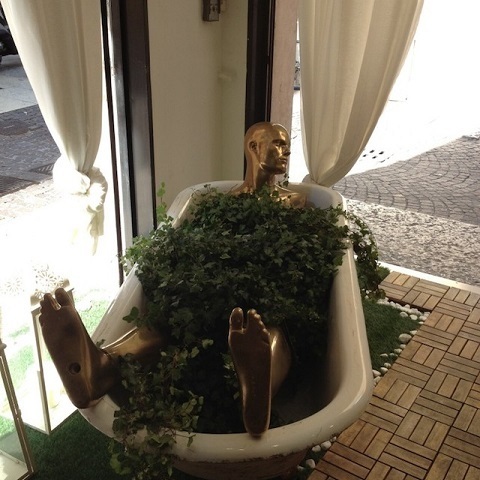 (I’m just glad it’s not a statue of Romeo!) And after, you can choose from a wide array of souvenirs and memorabilia …yep, you guessed it…I couldn’t resist that either. We have a little time left and there’s one last place we must visit before our sweet parting… Si! 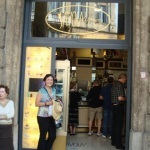 A local favorite for gelato, of course! Now, that’s a happy ending! Buonissimo! La dolce vita sums up Victoria’s passion and love for all things Italian. An American living in California, her heart is always in Italy. As a travel consultant, blogger, and writer, Victoria loves sharing practical no-nonsense travel tips and insights on her travel blog, PostcardsfromTravelPiZazz.com and now offers two boutique tours to Italy. Connect with Victoria on her blog, Facebook, Twitter, and Pinterest. 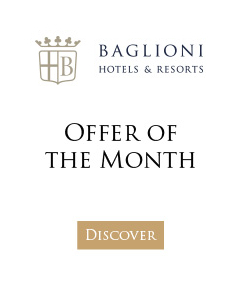 Concierge tip: Register for the My Baglioni program for special benefits when booking a stay at Carlton Hotel Baglioni in Milan or Luna Hotel Baglioni in Venice, combining your romantic trip to Verona with a memorable experience in these great Italian cities, both of which are within easy reach of Verona. 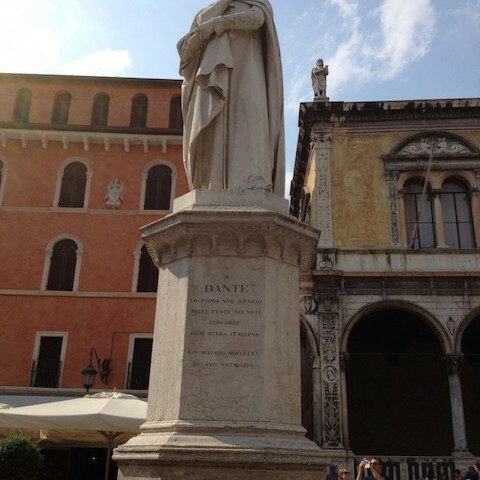 Thanks to Mr. Shakespeare the world associates the city of Verona with star-crossed lovers and two famous gentlemen. There’s also the annual opera festival held mid-June through early September, which attracts crowds to the celebrated Roman arena.